Well here you have it – one year of Thursday doors on Natural Adventures. Technically speaking I have been doing this for just over a year now, but have missed the odd week now and again. For my own satisfaction though I couldn’t really celebrate one year of Thursday doors until I had completed 52 weeks. Just the one door this week, and one I know little about. I took the picture while on a short break in Barcelona back in March and it combines two passions…Doors and street art. I don’t know the artist, and I am way too lazy to look up much about the building the door is on, besides which I don’t think it really matters. It is just a great door. Thank you. Taggers drive me nuts, but they won’t stop. While I understand what you say, the very fact that someone tags an artist’s work (for whatever reason) creates or establishes the ephemerality. I don’t believe that the initial labor is made in the belief that this work may only last for hours or minutes. I’ll stop before I start an angry rant. It is part of the scene. Really annoying, but all the artists understand their work is ephemeral. Congratulations on your door-aversary, Stephen. 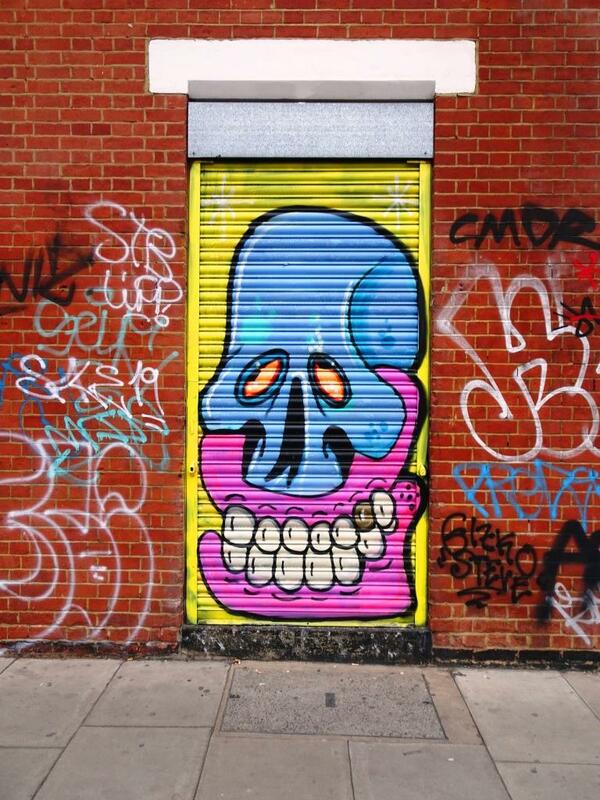 I love the door, but as one bit of graffiti says, the graffiti on it is the bane of a door-lovers existence!! They should go mess up their own property! The taggers are mostly ‘pond life’, but occasionally some of them grow up and become great artists. Cristian Blanxer with the original door and Konair with the ice cream tag… Tagging in BCN will not stop. Artists even tag their friends pieces. The jungle is crazy. Totally crazy. Thanks for the ID. That indeed is a great door!